IQA Journal is now on line. 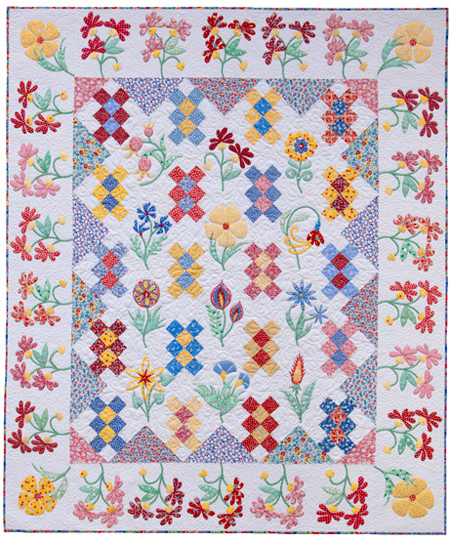 It has some absolutely gorgeous appliqué quilts in it, and the stories behind them. Be sure to go and flip through the pages electronically! I’m off to Long Beach in a couple days, so see you in August! I wrote a little bit about this in the Back Basting Redux post. I’ll repeat that bit here. The culprit in chunky curves is the turning allowance and how it’s acting underneath the appliqué edge once it’s turned. First, make sure your turning allowance is not too wide. A quarter of an inch is actually too much. Trim to about 3/16″ of an inch, and distribute the bulk of the turning allowance smoothly underneath as you stitch. Make sure it’s not pleated up on itself under there. In this illustration, I’ve made an appliquéd heart transparent so you can see what’s happening underneath the turned edge. On the lefthand side, the bulk of the turning allowance in distributed evenly and the curve of the stitched edge is smooth. On the righthand side, the turning allowance is pleated up on itself and is causing bumps and points in the stitched edge. Just make sure your turning allowance is not too wide and that you work a little at a time, turning and distributing as you go. Don’t reach ahead and pull the turning allowance back towards you as you stitch. Hope that helps!! I just got word from my publisher that Inspired by Tradition is going into a second printing! It hasn’t even been five months! That’s gotta be good, right?? 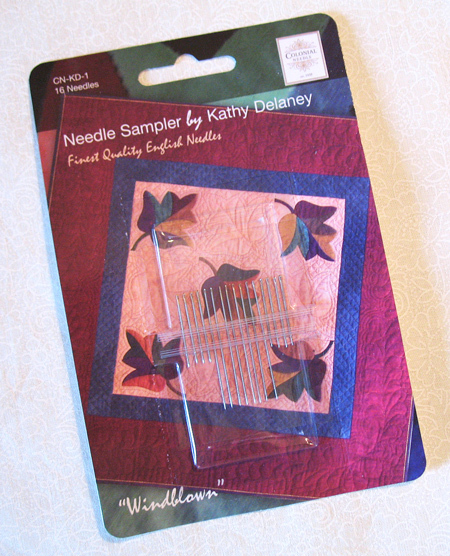 I heard from Kathy Delaney that she had a run on her needle packs after I posted about them last time! How cool cool is that! I’m sure that all the batik hand stitchers are now enjoying their Gold ‘n Glides! I’ll be in Long Beach for the summer edition of International Quilt Festival once again this year. This is such a fun time, I’m really looking forward to it. Hope to see you there, July 29-31. Any help you can give us in spreading the word to quilters, quilt collectors, museums, and aficionados about the auction would be greatly appreciated. All profits fund Alzheimer’s research. During Spring Market, I stopped by the Colonial Needle booth and introduced myself to Pepper Cory. It was a great conversation starter to lead with the fact that I am a fellow native North Carolinian LOL! Pepper was hanging out with Colonial Needle because she has really gotten into the Big Stitch way of hand quilting and has put together a special pack of needles just for this style. When Pepper learned that I was an appliqué enthusiast, she asked me if I ever worked with batiks. I told her that I do have a small tub of batiks, but for hand work, not so much. She handed me a needle sampler pack that was put together by appliqué artist extraordinaire Kathy Delaney. Since batiks have a very tight weave and a sort-of crispy finish, they’re a bit tougher to needle by hand than regular quilter’s cottons. 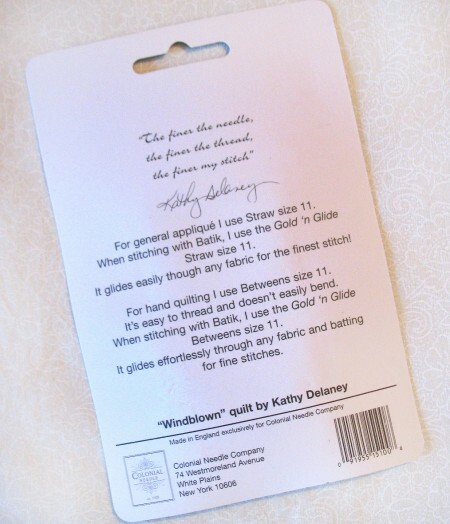 On the back of the pack, Kathy says that for stitching batiks, she uses John James Gold ‘n Glide needles. They’re coated to slide through fabric even more easily than regular appliqué needles. 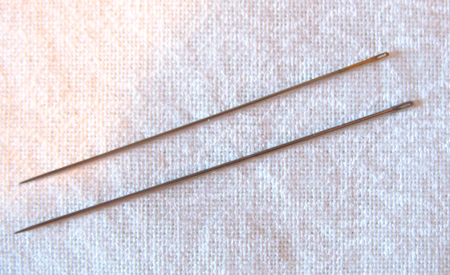 I’ve heard of Gold ‘n Glide needles for years, but hadn’t ever tried one. I decided to give them a whirl. 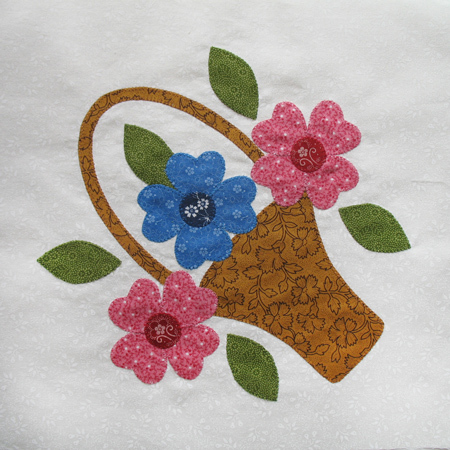 I chose the Spring Basket block from my Inspired By Tradition. Here’s the one that’s in the book. I pulled out my rather sparse stash of batiks and batiky-likes and chose some fabrics for this new version. The light green and dark purple are hand dyes and the brown is a Moda Marble. 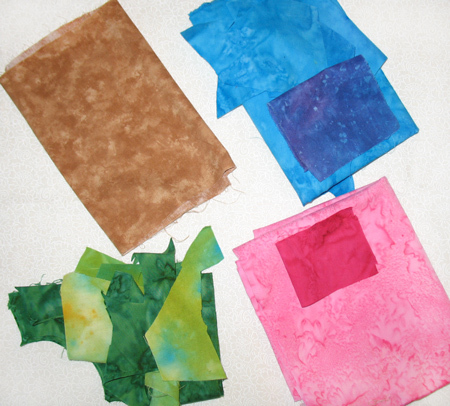 The other fabrics are all batiks. I didn’t have anything to use for a batik background, so I decided to keep with the spirit of the challenge and use a creamy white-on-white. Sometimes stitching through these can feel like punching your needle through dried latex paint. Look at these funky scraps! They’re left over from the Keri Duke workshop. Here’s a photo of my usual hand appliqué needle, John James milliner’s No. 10 (below), and a John James Gold ‘n Glide No. 11 from the pack. When I first picked up the No. 11, it did feel a little strange in my hand since I usually work with the next size up. The sampler pack included both regular straw needles and Gold ‘n Glide straw needles, No. 11. (BTW, straw needles and milliner needles are the same thing.) I stitched the hand dyes and the printed marble elements first and got those out of the way. 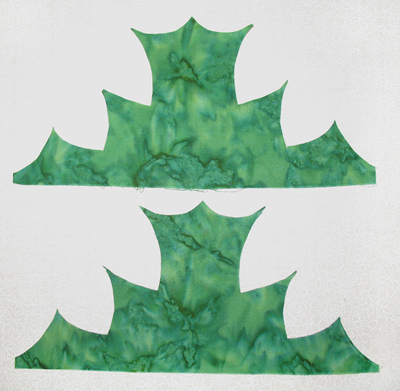 Then I started on the dark green batik leaves. I did the first one with the regular needle from the pack. The needle felt grabby and squeaky going through the fabric, kind of like eating undercooked green beans. For the second dark green leaf, I switched to the Gold ‘n Glide needle. Did I feel a difference? You betcha! The catchiness and squeakiness was gone! What a relief. I stitched away, glorying the in glidiness of this golden-eyed needle. I tell you what, if I ever embark on a whole hand-appliquéd batik project, I will go out and get myself a pack of Gold ‘n Glides. But probably in a Size 10… I did have significantly more trouble threading the needle, even with the gold eye. 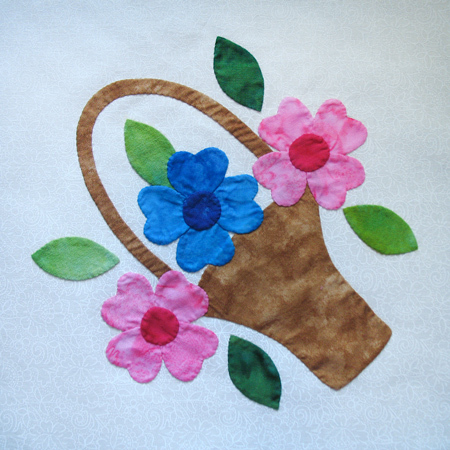 Here’s my Batik Spring Basket. If you’d like to try them, Kathy offers the sampler packs and regular packs of all of her favorite needles on her website. Donna A. came up the winner for Treasures From the ’30s. She says that she is sooooo excited and can hardly wait for it to arrive so she can plan and scheme. Congratulations, both you gals! The books are going out in the mail today. Enjoy. Many thanks to everyone who entered the drawing. I appreciate your reading my blog. '30s + '30s = Double the '30s fun! I have two fabulous books to show you this month, both hearkening back to the cute, cute fabrics and quilts of the 1930s. 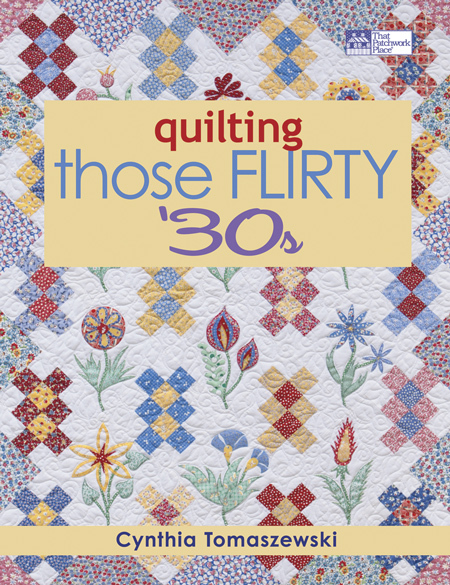 As promised, I got my hands on a copy of Quilting Those Flirty '30s by Cynthia Tomaszewski. Thank you, That Patchwork Place! I know what she means! All those ’30s repro prints just always seem to work together. It’s like they all have the same amount of gray in them or something. In case it’s not enough to give us designs and instructions for very cute projects, Cynthia give us recipes for delicious cookies too! Butterscotch Oatmeal, Gingersnaps, and Peanut Blossoms are just a few of the old-fashioned confections sprinkled throughout the book. 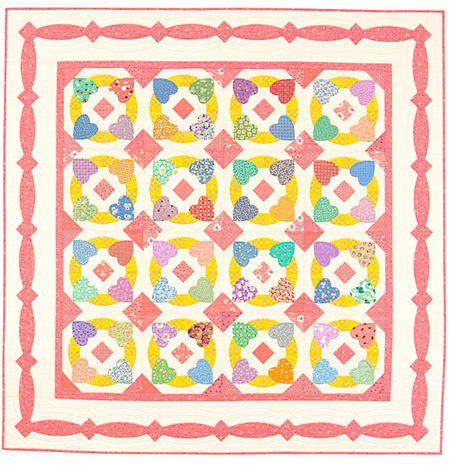 To being with, quiltmaking basics are covered, including information on fabric, tools and supplies, rotary cutting, machine piecing, adding borders, and all the way through layering and basting, quilting, and binding. 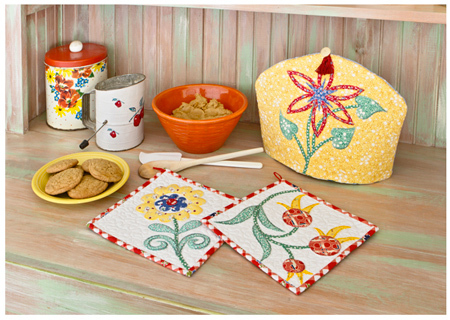 Then there’s a fabulous Introduction to Appliqué that gives Cynthia’s three favorite methods: fusible, freezer-paper-underneath, and traditional needleturn with a marked line. The author says, “Try them all so you have the ability to use the technique that’s best for your project.” And, you can mix them together for more variety and texture. The follows the section of projects. Sooo cute, every one! Here are just a couple. If you’re a ’30s fan, you’ll love Cynthia’s family stories, cookie recipes, and fresh quilty take on the decade. And be sure to go and read her interview over on the Martingale blog. This is quite the adventuresome woman! 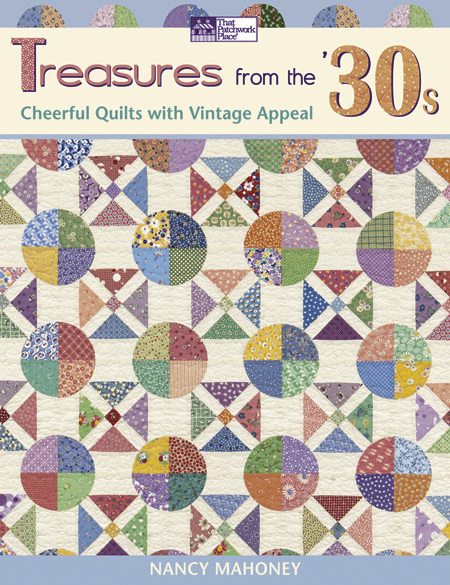 Continuing the blast from the past, we have Treasures from the ’30s: Cheerful Quilts with Vintage Appeal by Nancy Mahoney. Full disclosure statement: Nancy is a longtime Martingale author with about nine books to her credit, and she also does editing for the company. At Spring Market, I found out that Nancy is going to be the technical editor for my next book! I’m very thrilled to have such a veteran author on my team. 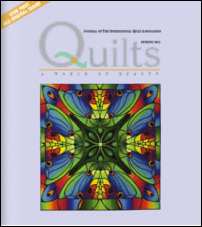 Never fear, Nancy starts with a whole section on quiltmaking basics, taking you through rotary cutting and on into several different methods of preparing and stitching your appliqué. You’ll find information on starch appliqué, hand appliqué, invisible machine appliqué, fusible appliqué, even embellishment! 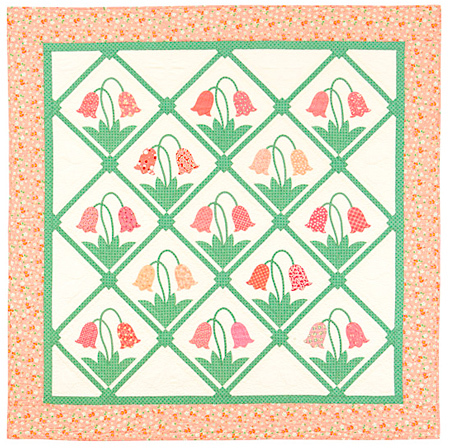 Then Nancy presents eight of her favorite 1930s quilt designs. All of the quilts are darling, and so reminiscent of an earlier time. While working on this book, the author became fascinated with the rich history of the decade, which included not only hard and depressing times but some wonderful, amazing things that she shares throughout the pages. I have one copy of each book to give away, thanks to the publisher. If you’d like to enter the drawing, just leave a comment by 7:00 p.m. California time on Wednesday, July 6. Open to U.S. and Canada addresses only. Also, be sure to leave your comment on THIS post. Sometimes readers poke around a little bit and end up leaving their entry comment somewhere else. The first winner will receive Quilting Those Flirty '30s, the second winner will receive Treasures From the '30s. Good luck, and have a fabulous holiday weekend! !